Are you thinking of applying for a short-term personal loan for the first time? The truth is that you may not get a loan approval from a bank or an alternative lender if you are not prepared enough. It is therefore important for you to become familiar with some of the essential aspects of a seamless loan application process to ensure loan approval while you choose the right financial institution. Know what you will need the loan for. Your loan budget and the type of short-term loan will depend upon your personal needs - whether you need a loan to pay a utility bill, or fund a vacation, or upgrade your car. As a next step, you will need to look for a bank or an alternative lender who can give you the best deal in terms of interest and loan tenure. Most importantly, you need to understand the loan terms and any hidden fees before you proceed. Check your credit score. This is an important loan eligibility criteria that most creditors look for in a loan applicant. You can request credit agencies like CIBIL, Experian or Equifax for your credit history and report. Once you know your credit score, you may talk to your lender about the credit score range they need in order to approve your loan. These days it is easy for you to check your credit score online whenever you need it. Click here to find out how you can apply for a short-term personal loan even with bad credit score. Secure the documents needed. All banks and financial institutions have their own set of requirements from a loan applicant. It is a good idea to prepare a checklist of necessary documents after speaking with your bank or alternative lender. This part of the loan application process usually takes more time due to documentation and approvals, particularly so if you are considering a traditional lender. It, therefore, makes sense to ask for a list of required documents in advance to avoid re-work from your end. If you need a personal loan real fast, you may want to consider an electronic lender who can give you an instant personal loan credit. 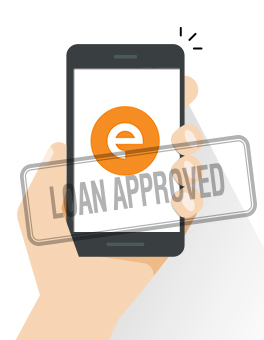 Find out how you can get a quick personal loan from an e-lender like CASHe here. Show steady income history. Whether you are an employee or a business owner, a steady income history will reflect the strength of your guarantee on the loan. Make sure you have the right documentation to support that you have a verifiable steady income history. Use personal loan eligibility calculators and loan EMI calculators. You can use online loan eligibility calculators and EMI calculators to compute your monthly EMI and loan tenure for the unsecured personal loan amount in advance. These are online eligibility calculators that map the loan amount to the tenure after adding interest charges, and tells you how much loan installment you need to pay. Have a backup plan. If you have done your homework right, you improve your chances of getting the loan approved, but there is no guarantee. 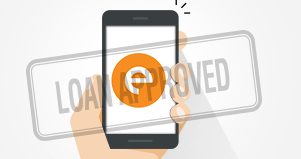 Find out from your lender about any time table of the loan process, and when to follow up. It will also help to shortlist additional lenders based upon your current financial scenario in case your loan application gets rejected by the bank. You can read personal loan FAQS for any additional information.